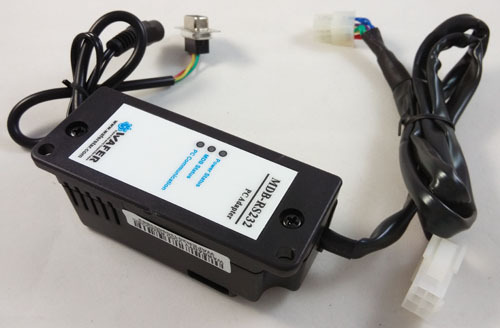 The vending machine standard NAMA Multi-Drop Bus (MDB) may now be interfaced to a PC using the MDB-RS232. The MDB-RS232 allows Coin Acceptance, Change Dispensing, smart card reader, magnetic swipe, credit card reader,bill acceptor and bill validation all controlled by the PC.Conforms to all NAMA MDB specification and is compatible with any MDB compliant vending device. Hardware interface comes with cables,user's guide and user's protocal. Up to eight (8) MDB compliant devices may be attached to a single MDB-RS232. The programming interface is user-friendly. 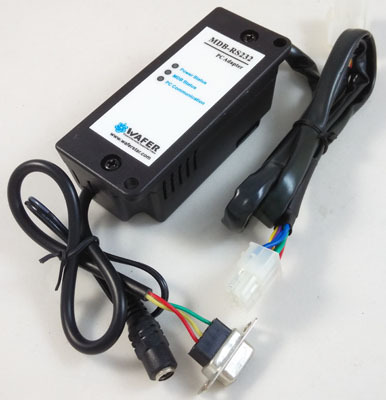 This Interface Unit (IU) is designed to convert the MDB Bill Acceptor (BA) and MDB Coin Changer (CC) protocol to RS-232 serial protocol. The IU functions as a slave to a master control system. The master may be any control system that supports RS-232 serial communication, for example a PC. The master and slave communication is based on master requests and slave replies. The master sends a status request (or command) to the IU and IU answers by sending its current status. The IU’s typical response to the Master’s request (polling) consists of a header and data bytes. If there is no BA or CC activity, the status is one byte, the header only. When the IU receives data from the BA or CC, it sends a header followed by data bytes in the response to master’s status request. The master must always poll (query) the IU. If the IU does not receive a query from the master in the predefined time slot or IU does not recognize master messages 10 times in row, it will inhibit the BA and CC acceptance. At power up, acceptance of the BA and CC is inhibited. What is MDB and Why do I need the MDB-RS232 ? MDB stands for "Multi-Drop Bus" and is a protocol developed by vending machine industry. The "Multi-drop Bus" (MDB) protocol is not compatible with the standard RS-232 PC protocol and therefore a hardware and software interface is necessary. The MDB-RS232 is a microprocessor controlled hardware interface with embedded firmware that converts the MDB protocol to an RS232 protocol and also performs the necessary voltage conversion. The MDB-RS232 also relieves the Polling requirements thereby allowing the same PC to perform other tasks. The MDB uses 11 Bits and a nine (9) bit byte. The polling requirements for the various MDB devices are excessive (20-200 ms). A non-dedicated PC can not meet the polling requirements. 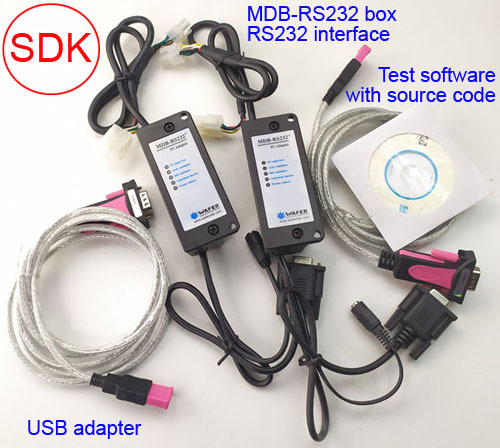 The MDB-RS232 takes care of the polling requirements and generates an interrupt on the serial port of the PC. This methods allows the PC to perform normal operations and respond to interrupt driven comm events in the UART buffer. 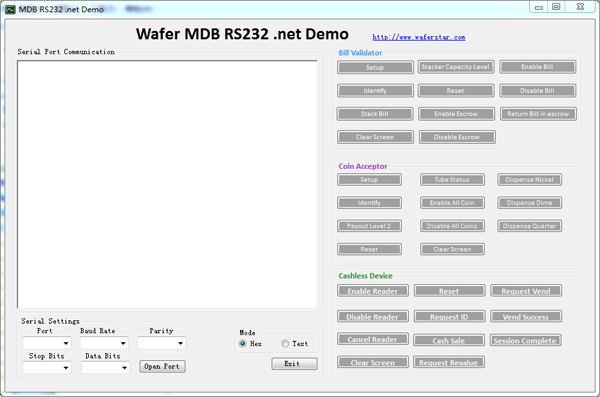 All data from an MDB device is available to the PC. The MDB-RS232 interfaces any MDB vending device (6-pin molex/5pin MTA) to the PC via the serial port (DB-9). Future support may include Universal Serial Bus. The MDB-RS232 protocol is compatible with standard RS-232 Protocol. Any MDB compliant device may be interfaced to a PC. This now makes it possible to accept and dispense any coin types including foreign currency and Euro Dollar (when available). MDB compliant smart card readers can now be accessed.